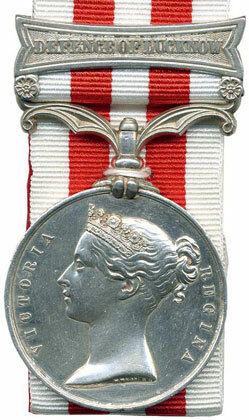 Warwick and Warwick Medal auction report 21st October 2015. There were 288 lots of medals and militaria in this sale. 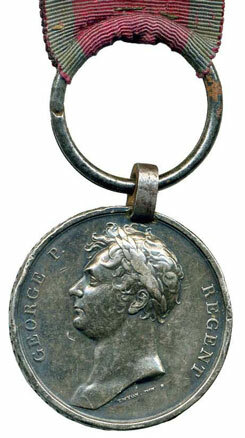 There were four 1815 Waterloo Medals in the sale. Lot 12 was to Thomas Fairclough 2nd Batt 44th Reg who served in Captain Brugh’s company at Waterloo. The battalion was heavily involved at Quatre Bras where it suffered heavy casualties when attacked by French Lancers before being able to form a square and Ensign Christie saved the colours from being captured by a Lancer. Total casualties for Quatre Bras and Waterloo were 20 killed and 165 wounded out of 455 unit strength, approximately 40% casualty rate. This sold for £2124. The campaigns of Queen Victoria were well represented. Lot 30a was an Indian Mutiny Medal to an original Lucknow defender, Corporal Buxton of the 32nd Light Infantry who was wounded during the defence of the Redan Battery on 30th July 1857. This helped push the price paid past the estimate, selling for £2006. 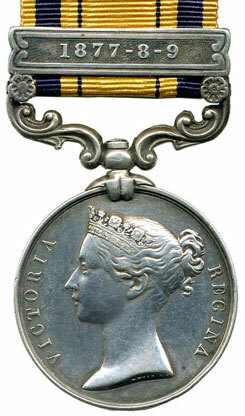 Lot 45 was a South Africa Medal 1877-8-9- clasp to 730 Private Henry Gilkes of the 2/24th Foot. The lot sold to a room bidder for £1357. 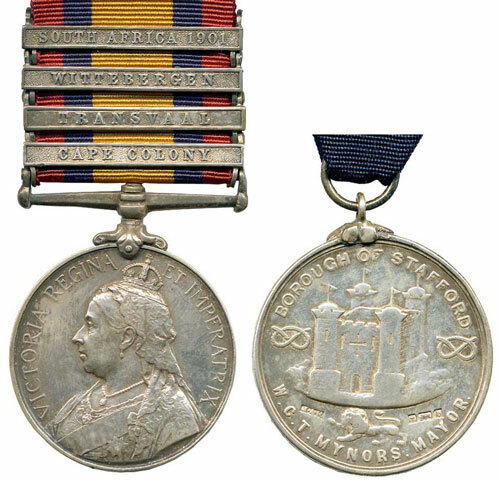 Tribute medals are becoming ever more popular and lot 67 was such a lot including a Boer War Stafford silver tribute medal to Private Horace Simpkin. The lot also included the rare scroll presenting the Freedom of the Borough to the medal recipient which drove the hammer price well past estimate with a room bidder winning the lot for £1416. There was another good selection of WW1 medals from gallantry to single medals. Lot 104 was a Military Medal and Bar group to a Sergeant Nicholson of the 8th Battalion Durham Light Infantry. He was wounded and gassed during the war and it just passed the estimate selling for £1239. Lot 171 was a scarce 1945 Minefield Clearance George Medal group to Lieutenant Borthwick R.E. which sold on estimate for £4956. There were 62 lots of militaria with some very healthy room competition. The German firearms proved a real hit with good results. Lot 230 a 19th century Afghan flintlock jezail musket sold for £177. There was a good range of edged weapons with lot 234, a Third Reich Army Officer’s dagger and scabbard, selling for £318. Lot 236 was an 1885 Pattern Staffordshire Yeomanry cavalry sword and scabbard which sold for £248. Lot 252a was a rare 211 page hand written journal by Sergeant John Richards of the 6th Dragoon Guards. 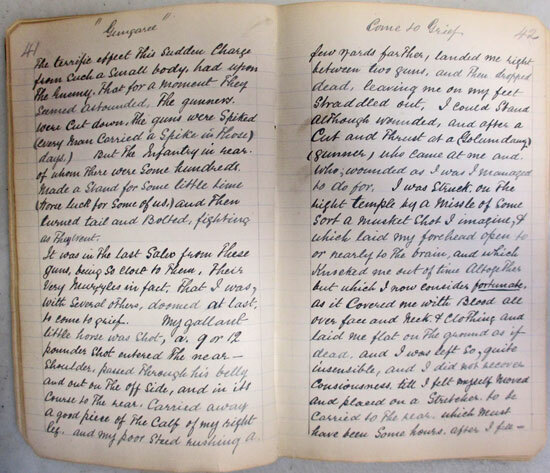 The diary covered his part in the Crimean War and extensive details of his involvement in the Indian Mutiny where he was severely wounded in the charge at the Battle of Gungaree on 14th December 1857. This lot sold to a book bidder for £424.